It’s the time of the year for the second expansion in the current block. 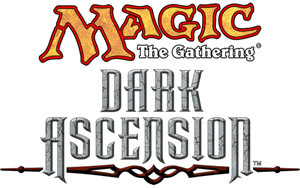 This expansion is called Dark Ascension and releases on February 3. That means that this coming weekend is the pre-release events. As the second expansion, it’s smaller than the first one (158 cards) but expands on the storyline started in Innistrad. There are a number of reprint cards and the spoiler lists I’ve seen don’t list basic land cards in them. I’m not sure if this means it will include basic lands with other expansion symbols or no basic lands at all. As with most expansions, it introduces new card effects. One that we get this time is “Fateful hour” which triggers when you have 5 or less life. This is a bit of a dangerous ability to play with since you have to be in a very vulnerable spot t use it. The other ability us called Undying. This is triggered when the creature with that ability dies. If it has no +1/+1 counters on it, it comes back into play with a +1/+1 counter on it. It’s the reverse of Persist which brought the card into play with a -1/-1 counter. There looks like there will be a few interesting cards but I think it will pale in comparison to the first set of the expansion. With the first 2 sets building up the dark side while giving us lots of humans to defend, it should be interesting to see what the last set will bring us to finalize the storyline.